Tonight is the Season 4 premiere of Leverage. While I have to admit that Season 3 wasn't as good as 1 & 2, and none that would make my all-time Top 5 list, but it did have some good episodes. In honor of tonight's debut, here are my Top 5 episodes of Season 3. 5. "The Gone Fishin' Job"
Episode 7 of Season 3 may have been Leverage's most outrageous to date since the Crew took on a con-man posing as a collection agent to fund a militia, and viewers really had to suspend disbelief to buy some of the action scenes. That being said, it was a great Eliot and Hardison episode as they had to spend most of the time handcuffed to one another. Just watching those two was worth the price of admission. Best Line: "High-five for morale." The Crew had to take down a corrupt used car salesman who sold boosted cars. The premise sounds standard enough, but this episode had a great guest spot by Bill Engvall as the baddie, and some great Parker moments. I was also a big fan of Malese Jow's run as Josie, the car thief in training. Three words: Christian Kane singing. Obviously, the hook of "Studio" was getting to hear Eliot sing, and it was an amazing job. The job, taking down a murdering music executive trying to muscle a lowly songwriter out of her only means of a living, was a nice change of pace. Once again, we got some great guest spots from Bo Duke, aka John Schneider, and Alona Tal. Of course, we got some awesome Parker tidbits such as her picking pockets while dancing and her best Bjork impersonation. 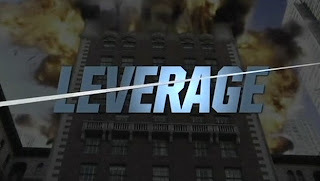 Leverage's take on Kurosawa's classic, Rashomon, wasn't an episode that added to the season long arc, but it's something all Grifters have wanted to see: the Crew before they teamed up. Riffing on the various points-of-view technique, we got to see the Crew all go after the same artifact at the same time not knowing that they'd meet up again. The best gimmick of the entire episode was watching how each character saw the others, and it was just so much fun. This episode was Parker's origin story and one of the best of the entire series. We finally got a glimpse of what makes Parker tick thanks to a wonderful guest spot by Richard Chamberlain who played her mentor and surrogate father. Having the Crew pull out all of the stops to save one of their own was amazing to watch, and seeing Parker realize that she's a part of a family gets me all misty-eyed. Also, this was when we got to see the wonderful big brother/little sister dynamic between Eliot and Parker. Great stuff. Best Line: "That's great. You're awesome. LET'S GO!" So there you have it, my favorite Season 3 episodes of Leverage. While it was an overall fun season, it wasn't on par with previous ones, and let's hope that Season 4 can take the show back to its great heights. Regardless, I can't wait for the show to be back.